Are you entering your car or bike at GreazeFest? Drivers are invited to show off their chrome dreams on either the Saturday or the Sunday, or both days. Cleveland Showgrounds, cnr Smith & Long Sts, Cleveland. Enter via GATE ONE off Smith St near the high school. 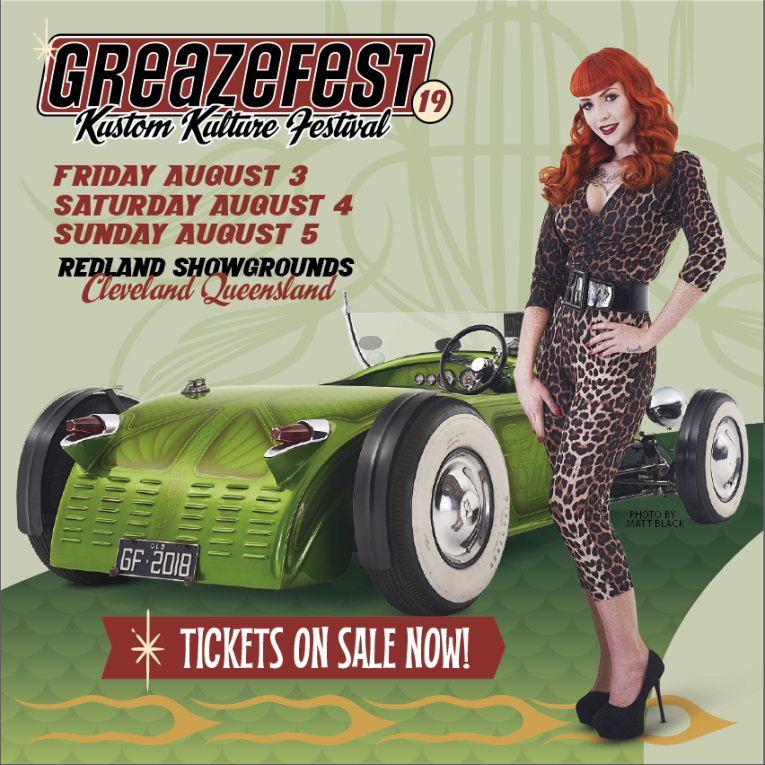 GreazeFest has a special $15 entry ticket for drivers of all show vehicles. There is no cost for your vehicle, just for the driver. American or Aussie pre-1970 Classics; Hot Rods; Rat Rods; Sleds; Muscle Cars; Customs; Vintage Motorbikes; Bobbers; Lowrider Bicycles; Daily Drivers very welcome. Buy your ticket in advance, or pay as you enter through the gate. Register your car on the day at the GreazeFest merch tent; or pre-register via the GreazeFest web site (click What’s On > Hot Rod Shows www.greazefest.com). Friday night parking is off Smith Street near the football club. If you have to leave early on either day, you can leave ‘on the hour’ ie 2pm, 3pm, 4pm. You must see the show marshals so we can walk your vehicle out of the show. For public safety, vehicles must remain static once parked on display. No BYO alcohol. No pets. Don’t drink and drive. Be cool. Follow the directions of our show marshals and event crew. Vehicles may stay parked in the display overnight on Saturday night. Security provided Saturday night. No sleeping in vehicles overnight. All care but no responsibility taken by show organisers. All entrants can register to go in the running for a GreazeFest trophy. The GreazeFest King Crown trophies are custom-made steel crowns, created each year by metal artist Rastra Lyall. Be sure to register! All drivers who register also go in the running for a kool GreazeFest Prize Pack drawn each day. Trophy presentation is on Sunday and applies for cars on display on Saturday, Sunday or both days.